conversation on Tuesday. "If you are scared to use your voice, then you've got to get up and give it to someone who isn't afraid to use the spot." She said. She shared her life experiences and how women are intimadated in their workforce. Many male bosses they even wouldn't have experienced about the parenting, try to intimidate the women comparing their work schedules same as them. They don't understand how difficult to be a working mother and how challenging it is to manage at work, home and taking care of the kids. 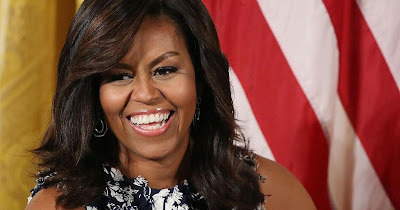 She encouraged the women; " Don't waste your seat at the table "
She recalled the time when she worked in the Chicago university with a couple of very young children and his husband the former president of the United State Barak Obama was far away serving as an Illinois senator that was the first time she demanded the flexibility that she earned it. She shared that she was the working woman breastfeeding four months of a child who didn't have babysitters. All of the women should understand how our voice will earn it. Many women in the world have suffered from the pressure of parenting and working together. We all women should make our voice together to make our work flexible hours and the company and owner of the company who also work on behalf of humanity and equality to make this world better should understand the women problems and should be accredited in their favor.